Following the success of their last themed evening, the Pentland Hotel are having a "Burger Night" at the "Princes Street Diner". 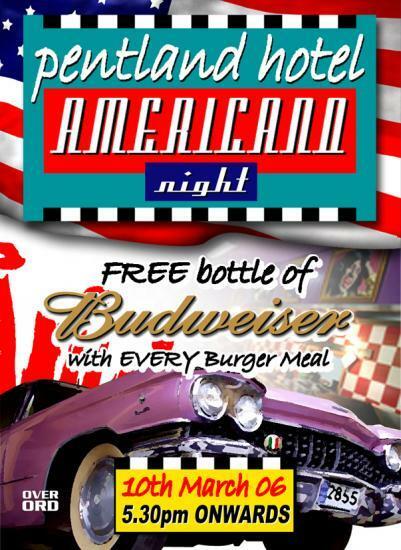 With a selection of homemade American-style burgers, appetisers and desserts on offer. Enjoy a complimentary Budweiser with every burger. The Pentland's regular evening menu is also available. Scotland's Year of Food and Drink sets the context for one-day conference on blogs and social media marketing at Thurso's Pentland Hotel. Final preparations are set for ‘the venture north byte 2015: food, photography, and the blogosphere,' a one-day conference on how to use digital communication and social media marketing at the Pentland Hotel in Thurso on Sunday, 26 April.